To meet the current complexity and rapidly changing business reality, 21st Century leadership requires something different from us. Leadership today is not just about adopting external best practices but leveraging our own unique human capacities by bringing our wholeself to work, not just our best selves. In this way we can develop our own authentic presence to catalyse, empower and inspire leadership in those around us. Since launching Female Potential last year I have been working on ways to express my deep desire to bring the wisdom practises I’ve experienced on my own personal development journey and combine these with the wealth of knowledge Cato has brought into our lives through his 10 years working at one of Europe’s top business schools INSEAD. 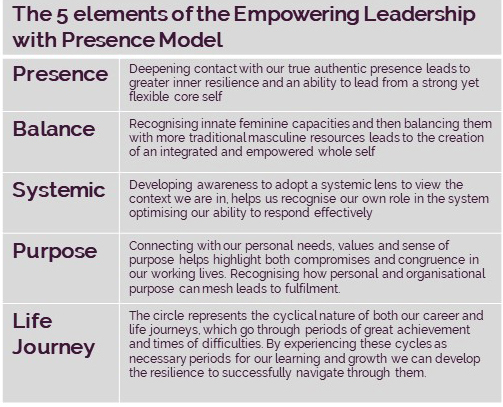 The Empowering Leadership with Presence programme synthesises wisdom from these personal mastery practices woven together with cutting edge leadership thinking to help you discover more of who you truly are and how you can develop your innate capacities to lead yourself and others. The Life Journey element of the programme runs throughout all 4 modules. Attendees will be at different stages of their particular life and career journeys, so this element of the programme will help them reflect on where they are through the lens of several different models, which in turn will help the whole group understand the cyclical nature of our lives and careers as we progress towards maturity. Delegates will be asked to write a 5 – 10 page Life Story in preparation for the programme as a self-reflection exercise, this document will form a working narrative throughout the year long development programme. As people we form a sense of identity by integrating life experiences into an internalised, evolving story of our lives creating a sense of self from which we approach life. Our story includes our remembered and reconstructed past, our perceived present, and our imagined future, all viewed through the unique lens of our personality structure. In addition, our personal life stories often follow greater cultural stories such as Joseph Campbell’s Hero’s Journey and/or Maureen Murdoch’s re-working of this seminal work for women in the Heroine’s Journey. These concepts will be woven through the programme to allow delegates time to reflect on their own stories and life stages as they progress through the maturation process to become better leaders. Presence is a quality that’s easy to recognise but difficult to define. When discussing Executive Presence it’s usually a mixture of confidence, gravitas, influence, power and authority that we are referencing, but when exercised unconsciously these qualities can be as destructive as they can be supportive in a leadership context. To become better leaders, we need to go inwards to discover our true authentic presence, so we can consciously lead from there. To do this requires us to develop ongoing practices which include self-reflection, mindfulness and working with the wisdom of the body. Without these “presencing” practices we mostly operate out of entrenched and unconscious personality patterns. Becoming present in the here and now, opens us to be able to witness our habitual reactive patterns and thereby choose to act differently enabling us to embody our most resourceful and responsive selves. Only by learning to go within and being present can we truly listen to another. Developing our ability to be present, deepens our connection to our core, when we are connected to our core then we are more able to deal with and accept whatever is going on within and around us. Leadership has traditionally been seen as a masculine trait – the militaristic model, the unquestioned boss, a powerful authority figure who employs archetypal masculine qualities of decisiveness, structure and action. To fit in with this world view, women who join the senior corporate ranks often adopt these traits as their own, pushing away, minimising or disowning archetypal feminine traits such as collaboration, flexibility and intuition, which are the exact traits the Athena Doctrine research identified as those most needed for 21st Century leadership. Working from the principle that men and women have access to both positive and distorted masculine and feminine traits within themselves, the Balance module helps delegates identify the dominate traits they are operating from, those traits most disowned in their systems and those that need supporting, to allow the harmonisation and balancing of the positive qualities from both genders to synthesise our own unique and holistic leadership blend. Developing a systemic awareness to view not only the system you are in but also how you yourself are reacting and responding as a player within that system is essential, it enables us to see ourselves as part of the systems in which we act instead of separate from them. Over time we build experience and get good at what we do, but that has the unfortunate side effect of making us “fossilised”, so we need to bear in mind that whenever we work within a system we are both part of the problem as well as the solution. Based on Ronald Heifetz Adaptive Leadership model we will experience working together in an adaptive way, where instead of providing answers, leaders must leverage collective intelligence from the system. Using principles of moving between “the balcony” and the “dance floor” delegates will get a chance to contrast their experience from both inside and outside of the system. Developing a systemic awareness also requires us to become aware of the habitual informal roles we unconsciously take up in systems and our own emotional triggers, together with the wider web of systemic challenges which includes: – organisational structure, informal networks, systemic biases, workplace norms plus unconscious gender bias. Many people struggle with the idea of having a purpose, unsure whether what they are doing is it, and if not, how do they find it? Will they ever find it and even if they do will they need to give up what they are currently doing in favour of working for the greater good? For this reason, we prefer to talk about having purpose rather than a purpose, as this allows a more fluid holistic approach to both our current and future roles. Because having purpose translates to finding meaning and value within our lives and work, just as it is right now. This requires self-reflection – what do we stand for in life? What has real meaning for us personally? What do we value for ourselves and others? Becoming more cognisant of our needs and values, which are often unconscious, helps us recognise the inevitable compromises and congruence between our own values and those of the organisations we work in. When we are able to work with purpose, finding meaning and value in whatever role we do, it leads to a greater sense right direction and ultimately fulfilment. The Empowering Leadership with Presence programme commences 5th April 2019, made up of 4 x 6 hour sessions across one year. Dates for the remainder of the programme will be agreed between the participants at the first module.